← #B2: The Dreaded Octonozzle! 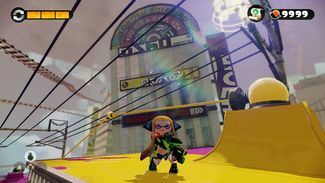 Inkrail Skyscape is the tenth mission in Splatoon's single-player mode, Octo Valley. It is the first mission of Area 3 after the second boss, The Dreaded Octonozzle!. The mission gets its name from its heavy use of Inkrails. When entering Area 3, head right and find two steep ramps. Use the ramps, jump on the platform nearest to you, then jump to the left where there are more platforms. Another ramp can be found, so swim up the wall and reveal the hidden Kettle. 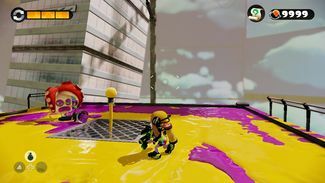 When you start, you will first see an Inkrail. Swim through it and you will end up on a small island with two curved ramps and a Twintacle Octotrooper will be waiting for you there. 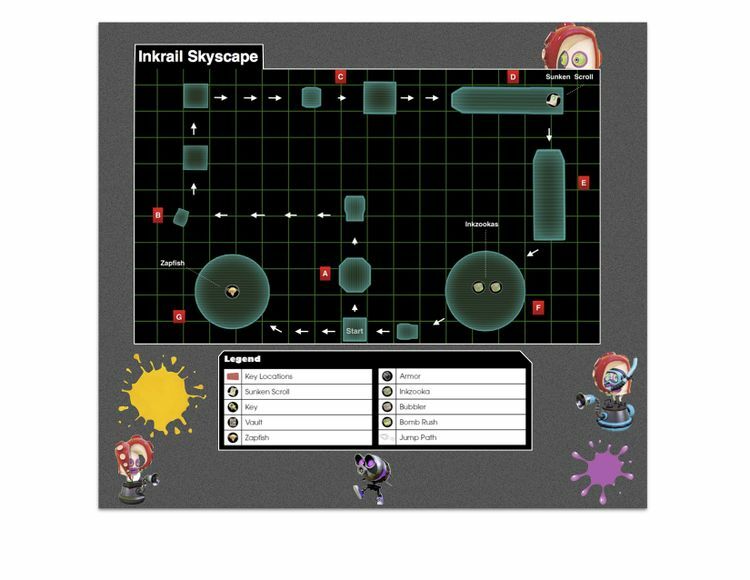 Splat it and then use the Inkrail to get to the next area. 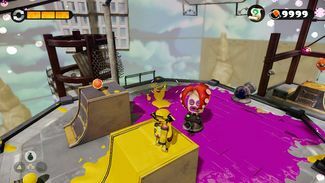 The Inkrail from the Beginning Checkpoint will take you to a rectangular platform with a Checkpoint, a new Inkrail, and a Twintacle Octotrooper on top. 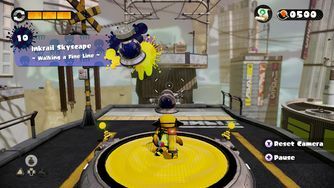 The original Inkrail wraps around the platform and can be used to stealthily splat the awaiting Twintacle Octotrooper. 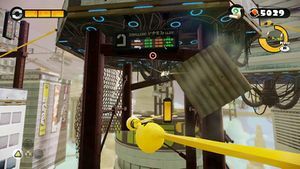 Once the Twintacle Octotrooper has been defeated take the new Inkrail and head on over to Sector 2. 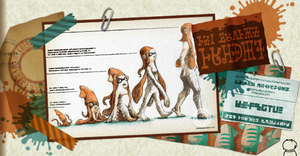 This section is similar to the first one, except that there will be two Octodivers hiding in the ink. Using the same method as in Sector 1, jump up from the Inkrail and splat them. The Inkrail to Checkpoint 2 is in the middle. 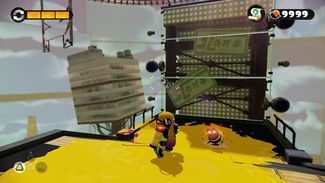 From there you will be on a platform with another Inkrail. It takes you under another platform and goes through a grate in the middle of it. Jump off it, then splat the two Twintacle Octotroopers riding around it. Then a Launchpad will appear. Swim through the Inkrail - you will drop off on the middle of a circular platform surrounded by water with a 'ring' on the outside. 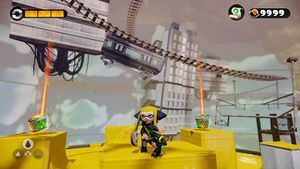 There will be some Octarians on the outside of the platform and two small curved platforms with Inkzookas on top of them. Take them. 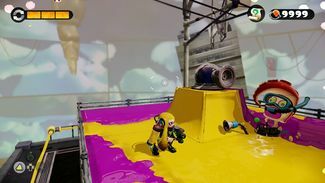 You can either use the Inkzooka to splat the Octarians from the middle or ink the sides of the ring with the Octarians, then swim, jump and climb up it so that you are on the same platform as the Octarians. Once all of the Octotroopers have been splatted, a launchpad will appear to the final checkpoint in the middle. If you jumped to the outer ring, you will have to paint the walls to jump back to the middle. 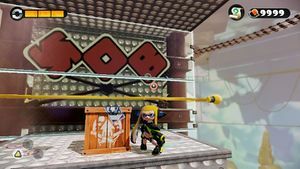 Instead of swimming towards the end of the Inkrail and dropping onto the middle platform, stay above the outer platform and lob a few Splat Bombs onto it. If the timing is correct, the Splat Bombs should take out one of the Twintacle Octotroopers. 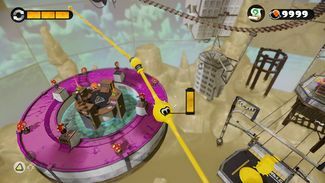 Once the Twintacle Octotrooper has been defeated, drop down to the outer ring and proceed to take out the remaining Octarians (four Octotroopers and three Twintacle Octotroopers). Once the final Octarian has been defeated, make your way over to the launch pad. Swim through the Inkrail that is in front of you to get to a large area with three towers. The Inkrail will take you to the first one. Jump off it then splat the Octotrooper on it. Repeat for the next tower. On the third tower, a Twintacle Octotrooper will be waiting for you. 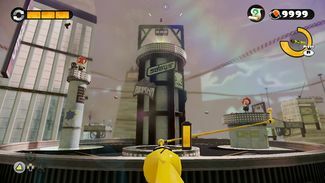 Splat it and then swim up onto the final tower, which will have the Zapfish. Burst its shield then take it. Location: At the third checkpoint, behind the second wall. 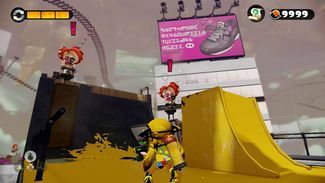 When you hit the third checkpoint, go up the first wall using the Inkrail. Splat the two enemies, then activate the three Inkrails leading up the wall. Instead of jumping all the way up, get in the second Inkrail and follow it around the wall to find a platform with the scroll on it. Location: On curved ramps on a big platform in Checkpoint Five. Enemy Twintacle Octotrooper and Deactivated Inkrail. 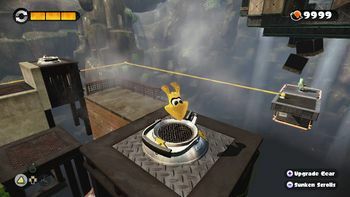 The Inkrail from Checkpoint 5 to the Final Checkpoint briefly goes underneath a structure from which a unique tune can be heard, distinct from the mission's normal music. It sounds similar to the jingle played by the tower in Tower Control. This tune can also be heard at the beginning and end of Spinning Spreaders. This page was last edited on 15 March 2019, at 11:08.